Sorry I have been almost completely absent lately… I’m in the middle of finals week right now, so I have had time for absolutely nothing aside from studying and writing papers! Ugh. I can’t wait to be done, but unfortunately I still have a couple of years to go before I graduate. Well, wish me lick for my last two finals! And if I don’t respond to your comments very quickly don’t despair, I’ll be back next week! Cut off the bottom inch of the asparagus, and cut the remaining stalk into 3 inch pieces (you should get about two of these pieces from each stalk). Cut each slice of bacon in half. 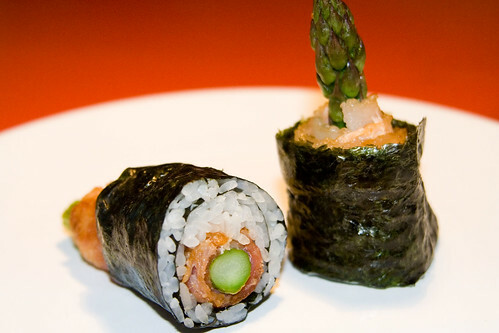 Roll each piece of asparagus in a slice of bacon. Put the bacon-wrapped asparagus in a frying pan over medium-high heat, and cook on all sides so the bacon is crispy. Roll the sushi. For your fillings, use 3 or 4 of the bacon-wrapped asparagus. They look so delicious, it’s making me hungry again >. Robert-Gilles – Yum! Sounds great… I may have to try that! After spending 8 days in two countries that have a distinct lack of raw fish in their cuisine, I am dying for sushi. Your site is putting a knife through my heart… but on I plow to catch up with what I missed while away. Mmm…. bacon!!! Yvo – Oh no! 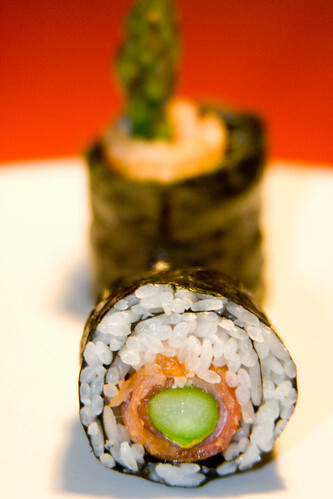 Well go get some sushi (or make some) right away! 🙂 Glad to have you back safely, and I’ll be keeping an eye on your blog to read all about your food adventures! i made these tonight to go with dinner. they were great! and a lot of fun to prepare. thanks for all of the tips and the tasty recipe!